for less than $30 ... guaranteed? where you will be asked to enter some details about your complimentary Bronze VIP membership in order to access your $3,000 of free bonuses. You're not alone. Millions of people each year decide to try to lose weight, and gain more health and vitality. Yet, the majority of those people fall short of their hopes time after time. And, although some people are able to shed a few kilos to begin with, long-term the changes are sadly often not sustainable and most end up back at the same weight they started at, while others end up gaining even more weight than they started with. However, the worst part of this painful process is not the extra kilos - it's that the cycle of continuously setting a goal and not reaching it leads to feelings of helplessness, frustration and often depression that there is no hope or possibility to change your situation. You cannot let this mindset control your future. There is a way to take control, overcome your obstacles and obtain all the health and vitality you crave for, as well as the body that you deserve. If you, like so many others, have had many unsuccessful attempts at losing weight it may seem impossible that there could be a real life-ling solution. But just for a moment, imagine there could be. How much better would your life be if you could reclaim your body and your life, forever? 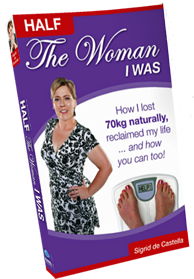 Permanent Weight loss with "Half The Woman I Was"
Sigrid de Castella has walked in your moccasins – for over 30 years she had set hundreds of goals to lose weight and had failed every time. At over 143kg, her highest weight, and the lowest point in her life, she discovered the ‘Secret’ to weight loss that would see her shed over 70 kilograms – half her body weight. During that journey Sigrid reclaimed her body, and her life, and “Half The Woman I Was” was born. It’s taken over 7 years to capture the ‘Secret’ Sigrid learned and compress it into an easy to read, easy to apply book so that others too can learn to take control of their health and their lives …. permanently. Sigrid doesn't believe in diets or quick weight-loss fads. She doesn’t believe in spending hours in the gym. So many have been told for so many years the "right" way to lose weight. But if it’s not working, then what is the real answer? After using herself as the ultimate test case, Sigrid has found that weight loss, just like anything else, comes back to getting your mind, body and spirit right. Until you can change these three areas of your journey and get them working together as a single unit you'll never be able to really change. For many people, over-eating is an addiction, providing an escape or comfort in times of need. Often times we don’t even realise we’re doing it. Yet, we’re sure you’ll agree that this pattern is a downward spiral. Even if emotional eating helps you for a few moments or hours, we’re sure you’ve discovered that it ends up causing you much more pain and frustration in the long-run. Change often only comes when we hit rock bottom, when we have nothing to lose, when we are forced to look in the mirror and take stock. In order to really make life-long lasting changes you have to be willing to explore what’s going on inside your body and your mind. You need to be willing to challenge yourself and your behaviours, to see them for what they really are and make a conscious decision to change. We often avoid doing this because of the pain of facing reality – it’s easier to stick our head in the sand and ignore it. But what if there was a better way to do this? You deserve to have real health and happiness in your life. But, you don't have navigate this journey alone. Sigrid provides you with a comprehensive plan that will help you to achieve real change once and for all. Half The Woman I Was will provide you with both the strategic tools and inspiration you need to create a healthier and more vital you, while Sigrid leads you every step of the way on your journey as your personal guide. The only limits we truly have are self-imposed. If you're ready to journey to a slimmer, lighter and healthier you then Half The Woman I Was has the tools to get you there. Half The Woman I Was is not just any book. Based on Sigrid’s proven system for creating lasting change, Half The Woman I Was is an empowering and comprehensive Program full of the tools and travel tips you need to take your journey. "Sigrid's candid narration of her weight loss journey in "Half the Woman I Was" is heartwarming, inspirational and entertaining. It is a story anyone who has been on the continuous yoyo-ing diet treadmill will relate to. The difference is that this is not an unachievable fad diet book - this is a real life, achievable plan with web support, tips and a workbook type approach to help you achieve your weight goals realistically and permanently." "Sigrid’s book is jam packed with all the information you need to take control of your weight management journey. Some of the stuff may not be new but to have it all in one book is really valuable. I have been on the dieting yo-yo ride myself most of my life and thought I knew it all, but there were some real gems of information in the book that I hadn’t come across before." "Sigrid’s book is not only written in a clear and interactive fashion, but also it's a terrific resource. Her explanation of GI or glycemic index is the clearest I've found as is the formula for calculating calories needed to maintain weight or to lose weight. Explanations, story examples, and directions are written as if she's chatting with you, the reader - very comfortable reading. The section about vitamins and herbal supplements is a wonderful resource. I now know the effects of too much or too little of some vitamin or supplement. Most fun is that in addition to being a useful "how to" book, the book also tells her story. I needed to keep reading in order to learn the end of it!" "Sigrid has an amazing story. Even though losing 70kg may not be unique, this book documents her unique journey and shows that anyone - man, woman or child - can live a healthier life based on sound nutrition advice and smart choices. Besides being well-presented, the text is written with Sigrid's inimitable sense of humour and witty observational skills; so its an easy and enjoyable read." If the 266 pages of jam packed information isn’t enough, when you buy the book you automatically become a Bronze VIP (Very Important Passenger) and get access to over $3,000 of added Bonuses - massive value on your $29.95 investment. And as you start to implement the program you will start to see a difference within just two weeks, and there’s plenty of support to help keep you on track for good. Research indicates that American overweight and obesity levels have steadily increased from 19.4% in 1997 to over 74.6% today; and Australia is not far behind at 61.4% and growing daily. This serious matter has spawned a thriving Weight Loss industry where Americans spend over $55 billion annually on weight loss products and services. In 2010 Australians spent $745.6 million on weight loss excluding gyms, personal trainers and other exercise-related expenses. The Australian natural health industry already generates $2.3 billion a year; that’s over $100 for every man woman and child. We live in an ever changing, fast-paced and stressful world, full of fast food and convenience options where it has become increasingly more difficult to find the time to maintain a healthy lifestyle and body. Our health is the most important asset we have. Isn’t it time you take control of yours? Plus the over $3,000 of FREE VIP Bonuses to help you achieve your desired weight and life-long health and vitality! My review of the best (and worst) body fat scales on the market so you can find the right set of scales to accurately measure your personal progress. My review of the best (and worst) diet journals and software on the market so you can find the right 'life jacket' to help you more easily retrain your eating to the correct portion sizes. There may be things you're doing that may be undermining your efforts to lose weight and keep it off. This quiz has been designed to help you determine what changes you need to make to your lifestyle to support better health and vitality. Take it as often as you need to so you can track your progress. The most comprehensive and realistic caluclator ever! Find out what weight you should be for your height and age, what your BMI is, your body shape type. Then it will help you determine your target weight, BMI and target bust, hip, waist and thigh measurement ranges. You'll also discover how long it will take you to get there! What are your current medical risks? How chan you change your life to better support your weight loss goals and lead a longer and more healthy life? Find out by taking this quiz and repeat it as often as you need to so you can track your progress. Are you eating the right foods to maximise your weight loss? Find out the secrets in this simple and easy to follow weekly plan. The delicious healthy recipes have been designed in single serves so you don't waste food. It's also easy to multiply the recipe to match your Target Daily Calories or if you're cooking for 2 or more! You don't need to exercise like crazy to lose weight. What is important is that you combine strength and cardio traiing. Learn the secrets of a great routine that, if performed correctly, will get you results with a minimum of effort. One of the key factors for life-long mobility is regular stretching to improve flexibility and prevent injury. How often have you exercised and then felt sore or stiff the next day? Stretching at least once a day as well as before and after exercise is vital to your exercise program. It doesn't have to take long, it just has to be performed correctly. Learn how to with this easy step-by-step guide. We all suffer from some level of stress and a small amount is actually good for us. However research now shows that high levels of stress, particularly chronic stress, is very closely linked to being overweight, obese and a whole range of pretty serious diseases. Use this Test to find out your stress ranking and what you can do to help combat it so you can knock down this hurdle to your weight loss. Did you know that all of those things left undone, unfixed, unsaid and unresolved can really hinder your weight loss? Find out why in my book and then use this step-by-step checklist as often as you need to bust all those "barnacles" in your life. You'll be amazed at the results you get when you do! Wondering how to get help? The Resource Directory is a constantly evolving and changing 'sealed section' of my website where I list all of the organisations and people you can use to help make your results actually happen. All of the participating organisations have undergone rigerous service and product testing by me to ensure they meet my high standards. And where I've been able to twist their arms they've also extended discounts and special offers to my VIP Members. We all need a little motivation from time to time and so I've combined images from travels around the world with my special messages of positivity and turned them into a great little weekly pick me up. Delivered directly to you by email each week for a year they are sure to help motivate you towards your goals. Can't find the time to exercise or eat right? It's amazing how much time each week we waste through poor planning. This little spreadsheet will cut through your weekly clutter, identify your core activities and help you find the time you're looking for in your week to spend on your weight loss goals whilst still ensuring you get some time out for R&R. The greatest gift you can give yourself and your family is to take back control of your life. Stop just existing and start creating your life exactly the way you want it so you can start actually living. The is the opportunity you have been waiting for. You can have the body that you desire. You can change your life … forever. Your future is waiting for you. Take charge of your health and your life right now! I believe that if you follow my program which is outlined in my book you will start to get real results. So if after 90 days you are not completely satisfied for any reason at all, simply send back the book in its original condition, and let me know why you're not happy, and I'll refund you twice what you paid for the book, excluding posting. I can't be fairer than that, can I?